Whenever you move to a new place — and this is country #6 for me — there is always a period of adjustment as you figure out how things work, and start to understand the ins and outs of the new culture in which you live. This learning curve can, of course, at times be confusing and frustrating, especially if you don’t speak the language, leaving you having doubts about whether moving here was a good idea! Take for example a recent fishing trip that we went on. I picked up a very nice looking brochure in one of the tourist offices here and decided to give it a shot. The picture showed a nice fishing boat, and promised drinks and a BBQ on board. It looked pretty good. However, as with many things in life and in travel, looks can be deceiving. We called the number on the flyer and a man answered. 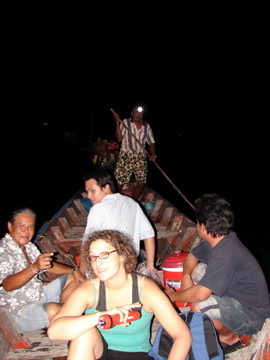 He told us that the boat wasn’t going out that day, but would be going out the following evening for night fishing. So, we decided to book the trip for an evening fishing experience. We pull up into the small Muslim Fisherman’s Village, and meet up with two other guys who shake our hands and introduce themselves. My suspicions that we were going on an unofficial tour were confirmed when he led us through someone’s backyard to a really rickety old longtail boat, pulled up on the sand on a dank smelling beach. The boat was musty and half broken, and the seats were moist and mouldy. I very reluctantly climbed in and tried not to touch anything. As the longtail pushed out into the shallow water, the sound of the Call to Prayer from the nearby mosque rang out through the bay. I now knew for sure that this evening was not going to be what we expected! We got out to the big boat, climbed aboard, and headed out to sea. The ‘guides’ started cutting up the bait, and once were anchored out at sea and our lines were in the water, they disappeared and started drinking whiskey! They must have been very happy to get that 4,000 Baht from us! Nonetheless, we were stuck out at sea, so Seiji and I decided to make the most of it. After all, what else can you do? You may as well try. So we dropped the lines, and hoped to catch something. One of the fake guides gave us a shrug and a smile. ‘I don’t know tonight, maybe no good. Today we no catch squid. No squid, no fish,’ he explained. And he was right. We barely got a few bites, and the only thing I caught was a rock fish which is extremely poisonous and not edible. 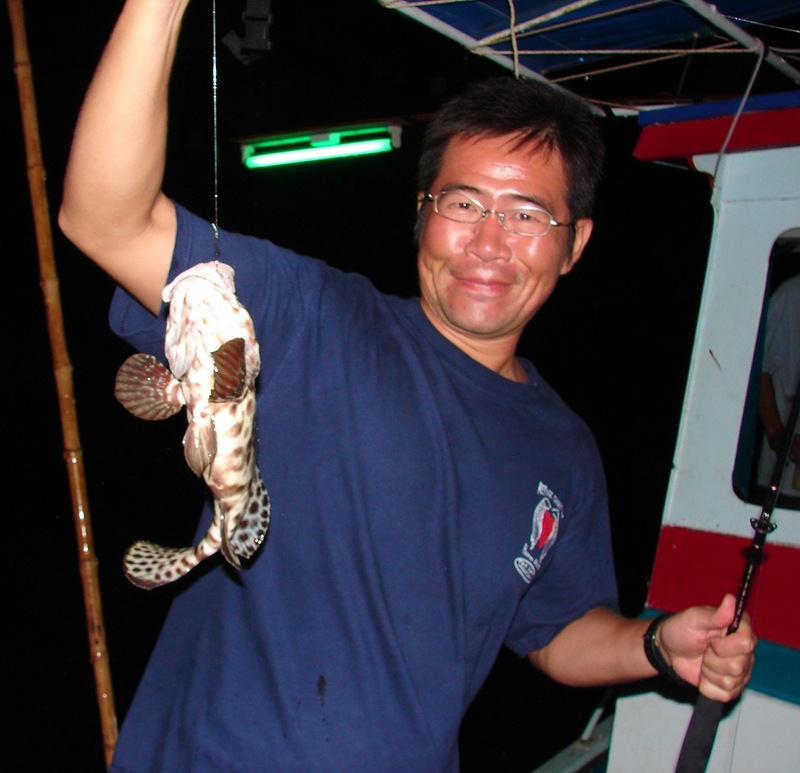 Thankfully Seiji caught one fish, a tasty looking grouper. It wasn’t huge but it would be some good eating. Then the rain started to come down. The boat barely protected us from the rain, and we had no rain gear. The guides hid in the back, wisely choosing to drink whiskey instead of fishing in the cold night rain. Right about that time the fake guides organised ‘dinner’ for us — they grilled some snapper they had caught earlier that day and provided us with a syrofoam box of cooked rice they had bought in the village. Again, not what we were expecting, and not exactly a ‘BBQ on the boat’. By about 11 pm, we were completely wet, cold, miserable, no fish were biting, and we had been fleeced of 4,000 Baht by these fishermen. Seiji and I decided to call it a night, write it off as a big mistake, and head home. So, the moral of the story is, when you go to a new place, do you research before you decide to do something. Talk to people, talk to the locals, talk to the other foreigners who are long-term residents, and don’t just sign up for something you see in a brochure. Buyer beware, especially in the third world!